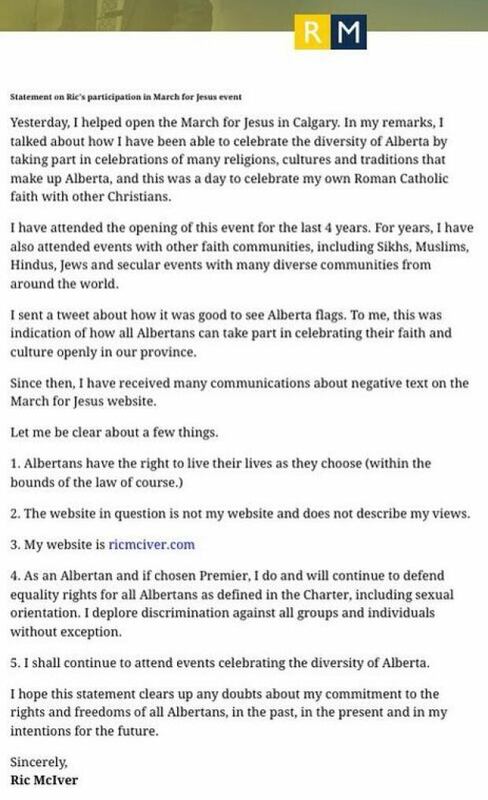 PC leadership candidate Ric McIver is trying to clear the air after participating in a March for Jesus over the weekend. The annual event took place in Calgary on Sunday. The website belonging to the organizers of the parade strongly condemns homosexuals. In a statement released this morning, McIver said he does not share the beliefs of organizers. Meanwhile, Twitter users pointed to a marked divide on how another PC leadership candidate spent their day — Thomas Lukaszuk participated in the presentation of Alberta’s first gender-altered child birth certifcate. The PC MLA declined to comment to the CBC about McIver’s participation in the March, but said he has been approached by same group to attend events and declined.